Violence Against Women affects everyone. It is not limited to any one community – it crosses all socio-economic backgrounds, races, ethnicities, cultures, abilities, sexual orientations, gender identities and occupations. When we say “women”, we mean people who self-identify as women. This is an inclusive definition - including trans women. The IRCNFF campaign recognizes that violence against women is not a single-issue struggle. Colonialism, anti-Black racism, xenophobia, racism, Islamophobia, homophobia, transphobia, and ableism impact how women experience violence and the extent to which they can access support. Violence Against Women is a term that is sometimes used to describe violence that women face in an abusive home or in an abusive relationship. This kind of violence is also called domestic violence, intimate partner violence, woman abuse, or family violence. In this website we will typically use the term domestic violence. There is a myth that domestic violence is just a fight between a couple, where one person gets very angry and loses control. This is not true: domestic violence is more like being held captive by a dictator. It is about one person exerting power and control over the other, using a wide range of tactics to control, hurt, and humiliate them. 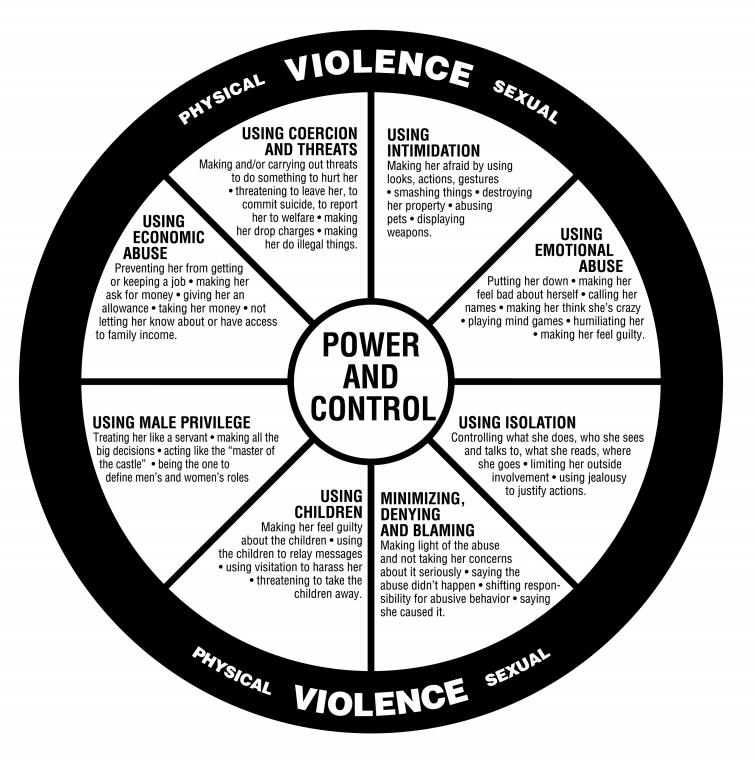 One model people use to understand domestic violence is the Power and Control Wheel. On the outside of the wheel, we see that the abuser uses physical or sexual violence. On the inside of the wheel, we see all of the other “tactics” an abuser uses. The violence and tactics “work together” to give an abuser power and control over the person he is abusing. Why Do We Need to Take Action on Violence Against Women? Why Focus on Immigrant & Refugee Communities? While all communities experience domestic violence at similar rates, research shows that immigrant and refugee women enduring domestic violence face particular barriers that make it even more difficult for them to get support. Social isolation: There are often not enough community-based resources for immigrant and refugee women in general, particularly for immigrant and refugee women enduring violence. Immigrant and refugee women are often not provided with information about what resources are available. Fear of Deportation: Abusive partners may use the immigration and refugee process itself as a way to exert power and control. Women may be sponsored by an abusing partner or have their refugee claims tied to the claim of an abuser. Abusive partners or families may withhold immigration documents and threaten to separate the woman from any children they have in common. Temporary foreign workers have their work visas tied to a particular employer, making it difficult to challenge abuse in the workplace. Non-status women are more vulnerable, since the precarious nature of their status in Canada causes constant fear of deportation. There are a limited number of organizations who are able to support non-status women because very few organizations are funded to do so. Fear of Police: Information-sharing between Canadian Border Services and police services prevents many women from calling police due to the fear of their status becoming known. Given some immigrant and refugee women’s experience with authorities such as the police, they may not feel comfortable reporting violence or abuse. Economic Exclusion: Foreign credentials are not easily recognized in Canada and many immigrant and refugee women experience “deskilling” upon arrival. Immigrant and refugee women are over-represented among the poorest in Ontario and the lowest-paying and least stable jobs. Lack of access to sufficient income can create economic dependence on an abuser and make it more difficult to leave. Language Barriers: Immigrant and refugee women often cannot access information and services in the languages they speak. Access to interpreters is not always available. Racism and Xenophobia: Immigrant and refugee women face are sometimes denied services or face stereotyping and harmful remarks due to discrimination from front-line services. Many immigrant and refugee women report having their culture and religion blamed for the violence they survived. Shelter services may also lack policies and practices to properly accommodate and celebrate diversity.